Made by Vatiliotis, Harry in Concord, New South Wales, Australia, 2001. Violin, case and accessories, spruce / maple / vinyl / metal / fabric, violin made by Harry Vatiliotis, Concord, Sydney, New South Wales, Australia, 2001. Violin with European spruce belly and maple back and ribs. It has a single piece back with straight grain running horizontally across the back. The fine tuner is on the top e string. There is an ebony fingerboard and timber tuning pegs. The carved scroll and neck is made from the one piece of maple. A chin rest is attached. Visible through the soundholes are a label and text written on wood. The case is rectangular and of brown vinyl with zippers and a lockable clasp. There is a plastic handle and adjustable fabric shoulder strap. The interior is lined with yellow velvet. There is space for a violin and a compartment at one end. The violin is secured into the case via a velcro strap. Rectangular yellow velvet cloth lined with yellow fabric. Clear plastic length labelled with manufacturer's name. 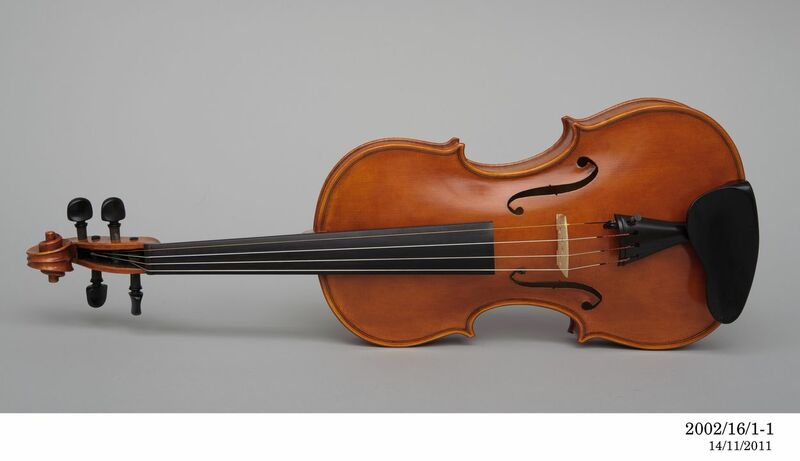 The violin was designed and made by Harry Vatiliotis after The Kochanski violin by Guarneri del Gesu of 1741. The violin was made in Concord, New South Wales, Australia, 2001. The violin has been used for a comparative study with other violins. Details of this will become available when the results are published. Construction of the violin has been photographed by the museum and the maker. Video footage has also been taken of parts of the making process.